Below is an interesting chart published by Tiho over at TheShortSideOfLong blog. This chart shows on the right axis the number of long contracts in oil (speculative positions as reported to the CFTC). As you can see, the number of long contracts far exceeds any historical precedents, including the period were oil was trading at above $100 and reached $147. Interestingly, during that time, speculators were closing their positions, and we still ended up with a massive 70% crash. Given what we see here, a $20 baril or even lower seems more than achievable. Here's a Bloomberg report relating the oil bullish speculations due to the events in Egypt. If you had to remember only one sentence, it would be: You can speculate all you want, but at some point the fundamentals have to line up with the speculation. Feb. 7 (Bloomberg) -- Hedge funds raised bullish bets on oil by the most in eight weeks on concern that political unrest in Egypt will spread and disrupt supplies from oil-producing countries in the Middle East. The funds and other large speculators increased net-long positions, or wagers on rising prices, by 17 percent in the seven days ended Feb. 1, according to the Commodity Futures Trading Commission’s weekly Commitments of Traders report. It was the largest gain since the week ended Dec. 7. About 2.5 percent of global oil output moves through Egypt via the Suez Canal and the Suez-Mediterranean Pipeline, according to Goldman Sachs Group Inc. The waterway was open and operating normally on Feb. 4, Ahmed El Manakhly, head of traffic for the Suez Canal Authority, said by phone. Oil may drop unless transport through the canal is disrupted, said Hamza Khan, an analyst with the Schork Group Inc., a consulting company in Villanova, Pennsylvania. Persian Gulf shares gained yesterday, sending Dubai’s index to a week high, as Egypt’s government met with opposition leaders to quell protests, stoking speculation the turmoil in the country may ease. Qatar’s stocks advanced. 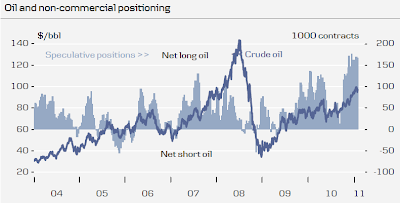 Net-long positions in oil held by managed money, including hedge funds, commodity pools and commodity-trading advisers, increased 29,928 futures and options combined to 201,941, according to the CFTC report. It is important to do proper research before one can assume what fundamentals are. Bullish sentiment is found in bull markets and we are overdue for a pullback, but Oil fundamentals are very very good. Hi Tiho. Thanks for your comment. I think it's all relative to your time horizon to be honest. Maybe oil fundamentals are very very good on a 10 year horizon. On a 6-12 months they are terrible: oversupply, record stockpiles of gazoline in the US, and an economy about to fall off the cliff.